"Four is the number of security and stability. Finding and maintaining this is a primary aim of the Four of Hearts. They tend to seek out other people as the source of their security. And because we give best what we seek, Four of Hearts create a sense of home and safety for those around them. They are grounded, practical, and caring. 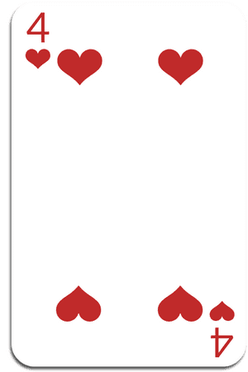 The Four of Hearts has a relationship with the realm of fantasy and imagination. Johannes Kepler, in order to discover that planets had elliptical (and not round) orbits, had to imagine it first. And Louis Pasteur, who shares his birthday, had to imagine germs before he set out to prove they existed. The author, C.S. Lewis, used fantasy to warm our hearts and bring us home. Peter Jackson, director of The Lord of the Rings trilogy, brought to life the fantasy world J.R.R. Tolkien with such accuracy, we wondered how he had access to our imaginations. Is your mind blown, yet? Such depth of talent, imagination and brilliance! The Four of Hearts have deep karmic contracts (the agreements you make with those you will meet up with to evolve your soul in this lifetime) which will shape them and have a defining influence. These deep bonds feel like..."